BEIJING (Reuters) - Both China and Taiwan have an obligation to assert claims to the South China Sea, China's Foreign Ministry said on Wednesday, in a sign of rare political agreement between the old foes on either side of the Taiwan Strait. Rivals China and Taiwan share claims to virtually the entire South China Sea, a legacy of the Chinese civil war when the Communists beat the Nationalists and took control of the Chinese mainland in 1949. The Nationalists settled on Taiwan and as the "Republic of China" still claim to be the legitimate rulers of greater China. Beijing regards Taiwan as a breakaway province and has never renounced the use of force to bring it under its control. 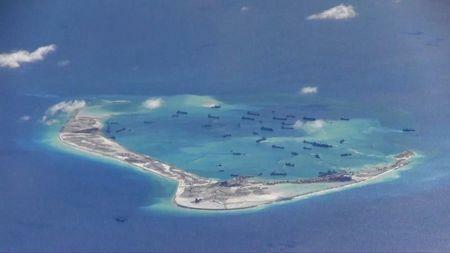 This week, Taiwan's Foreign Ministry reiterated its claims to the South China Sea. Taiwan occupies the largest of the Spratly Islands, Itu Aba, as well as the Pratas Islands, which lie between southern Taiwan and Hong Kong. Asked about the Taiwan comments, Chinese Foreign Ministry spokeswoman Hua Chunying said that after World War Two, the then Nationalist government of China had made "positive efforts" to protect the country's claims in the South China Sea. This was something the Communist government carried on, she added. "In the present situation, Chinese people on both sides of the Taiwan Strait have a responsibility and obligation to maintain national territorial sovereignty and maritime rights," Hua told a daily news briefing. Itu Aba boasts the larger of two landing strips in the archipelago and is the only island with its own fresh water supply, making a long-term presence possible. Taiwan has tended not to take sides with China in the South China Sea, despite the historical ties, given the political mistrust between them - and because of its need to maintain good relations with its biggest ally and arms supplier, the United States, a vocal critic of Beijing's policies in the disputed waters. Vietnam, the Philippines, Malaysia and Brunei also have competing claims in the strategically located waters, situated on a major shipping lane. Taiwan and China have signed a series of landmark economic agreements since the pro-China Ma Ying-jeou took power in 2008, but deep suspicions remains, especially in now proudly democratic Taiwan.